Ya know what Snowbrushy......we were related before we even communicated for the first time. Them mountains and all that makes them up, is our home. That makes us brothers. I'll still be tying up loose ends. I'll visit Cashmere, the Museum, the Wenatchee Cemetery and wander up to the Lake to look in on Byron, Bruce and Ron Siderits. 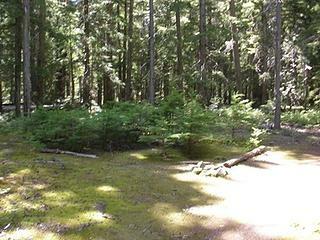 Then I'll wander up the road to Lake Creek Campground and take one last walk, up to the cabin site. I'd like my son to see that spot. Nothin' Prettier.....Except my wife. Okay....So I took the Road Trip yesterday to Wenatchee to find Buck's grave site. It took some digging (literally). Then I stopped in to see Ron Siderits at Lake Wenatchee and chat a bit. Lastly, I went up the road and took a short hike to the old cabin site. Long day, but finally got it all done. Thanks Chico! The man made an impression on me. It's the least I could do in return. 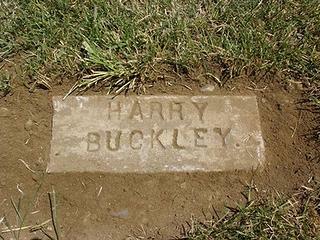 His headstone was completely buried under 5 inches of grass and dirt. Not a trace of it was left to be seen. At least now he'll get another 45-50 years of daylight and a spot on the web, for others to see. It was a good journey. How the heck did you find it? The cemetery guy helped out. I went out to the general vicinity and looked around, based on his directions. Couldn't find it. So I went back to the office and the gentleman checked the plot location and came out with a spade and foot edger. He found one right off the bat, by digging the edger in to find "concrete. He dug that one up.....wrong one. So he took his bearings off of that one, took three steps back and stuck the edger in again. Bingo, more cement. So he dug again. Sure enough, there was Buck's marker. They were VERY helpful. If those guys didn't know their business, I'd still be wandering around out there....with no chance. Me thinks they need to get out there and see what other markers are buried. If I was family I'd be a bit upset. Most of these cement brick markers are Pauper's graves. Not likely there are any remaining relatives, as was the case here. They are hard to see regardless and tend to disappear from mower clippings, settling and sediment washing downhill. At least they "know where to look", if needed. Consider death the same as life.....those with, are always in the forefront and those without, forgotten in the darkness. Just, no more bickering between them. This thread was VERY interesting to follow. Good on you, Rick H for persevering. We've all had people who touch our lives in some way; it's great that you were able to follow this to the end. To all who provided input, it was great to see everyone work together. What an amazing history. Thanks LizzyRN. Fortunately through this endeavor, I've made a new friend. Ron S. is the guy who really made it possible for me to track down Buck and close this chapter. I'll be heading back up to Lake Wenatchee next week, just to stop in and visit with him. Funny thing.....he's an old trapper, just like buck was. 83 Yrs. young and "still" out trapping. That's not a hobby for the faint of heart with weak legs. The man shakes hands like a grizzly bear. Another amazing fellow. If anyone ever has that urge to look up someone from their past, I HIGHLY recommend doing just that. Well worth the journey.